Back when I first started blogging almost three years ago now, I published a post called '21 things before I turn 21' and it was a great success, so I thought I would share with you all 16 things which I'd like to accomplish before 2016 is over - both blog-wise and in my personal life. 1. Say 'yes' more - this is pretty much always a goal for me. I have a habit of saying no if I'm scared of doing something (even if it's something I really want to do) or when I get nervous, so this year I'd like to finally break that habit and say 'yes' to more opportunities. 2. Improve my photography - this one's fairly self-explanatory but I'd really like to up my photography game in 2016. I really enjoy taking photos but often feel that my photos aren't up to the right standard for the blogging world, and this is something I'd like to change this year. 3. Travel often - there's so much of the world I have left to see and this year I'd like to make the effort to see more of it, even if it is within the UK. I work in an airport so I should be in the right place to achieve this! 4. Start saving - Now that I'm finally out of education and into the real working world, it really is time I started saving. I don't want to be renting forever and a deposit won't pay for itself! 5. Get organised - I used to be such an organised person and this past year I seem to have fallen out of that habit. It's time to have a bit sort out of everything I own and get organised for the year ahead. 6. Invest in key pieces - Instead of wasting my money on more fashionable items which will no doubt go out of style in a month or two, I'd like to buy one or two key pieces instead that will stand the test of time, something like a classic trench coat or a good quality handbag. 7. Develop a posting schedule - Big changes in my lifestyle this past year meant my posting schedule went out the window. This year I'd like to get back into a routine, similarly to my 'getting organised' point. 8. Read more - I love reading, and get completely engrossed in the stories I choose to read, so it's a shame that this past year I haven't really read so much. I have a couple of long haul flights planned, so I'd like to spend that time getting into a good book or two. 9. Be a tourist in my own city - I live in one of the greatest cities on the planet, yet everyday I ignore the beauty that surrounds me. I'd like to spend this year really exploring my city and stop taking it for granted. 10. Look after my skin - it's time I developed a proper skincare routine and gave my skin exactly what it needed, it won't look 22 forever after all! 11. Keep in touch - I am the worst person for keeping in touch with friends, and now that we live all over the country its more important than ever. I'd like to make more of an effort this year to keep in touch with all of my friends, both near and far. 12. Continue my education - whilst my school and university days may be over, there's still so much our there to learn. I'd like to continue my education by attending some lectures in topics I'm interested in, visiting museums and historical landmarks, and listening to a podcast or two. 13. Take time off - I haven't had a proper break in about three years now. When I'm not at work I spend my time working tirelessly on my blog and sooner or later it's bound to catch up with me. This year I'd like to take more time off properly and spend some time offline. 14. Celebrate more often - there's so many little things in life worth celebrating and there's no reason why we shouldn't do it more often. There's no point saving things for big events and occasions that will never happen, instead I plan on breaking out the champagne more often to celebrate life's little accomplishments, and of course the big ones. 15. 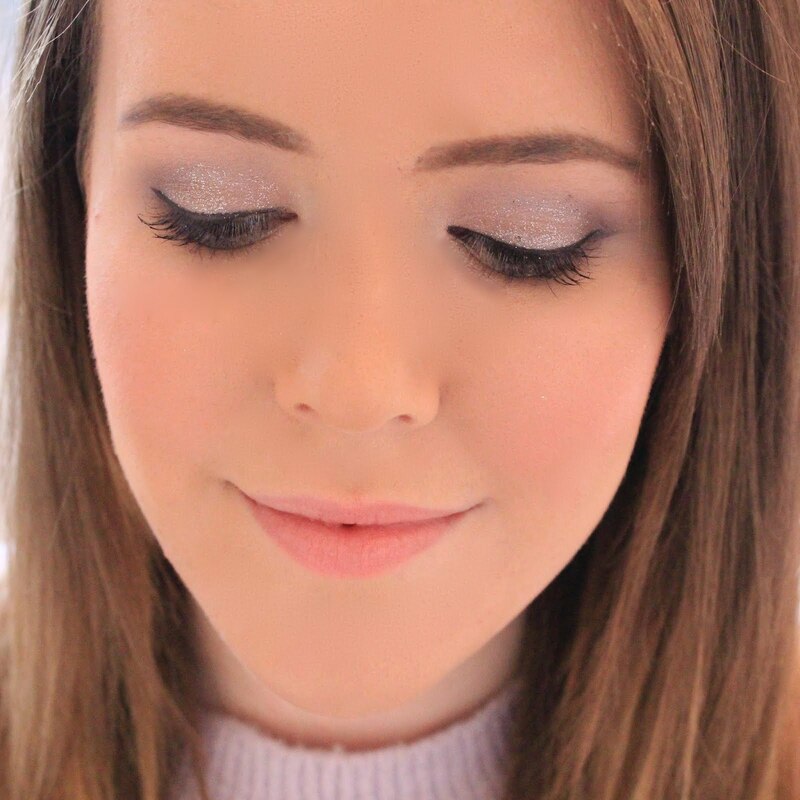 Wear less makeup - this may sound strange coming from a beauty blogger, but this year I'd like to strip back my makeup and instead focus on products which enhance what I've got instead of covering myself up. It's about time I learnt to love what I have instead of resenting every flaw. 16. Be myself - and finally, I'd like to have the confidence to be myself this year. I spent too much time trying to please others instead of doing what I want to do, and this has to stop this year. Such a lovely post! I loved all of the things you picked out and that photo at the top is beautiful. I want to try and save this year also, and travel more too. I'm hoping I can improve my photography too, it's always a constant source of trying to improve my blog! 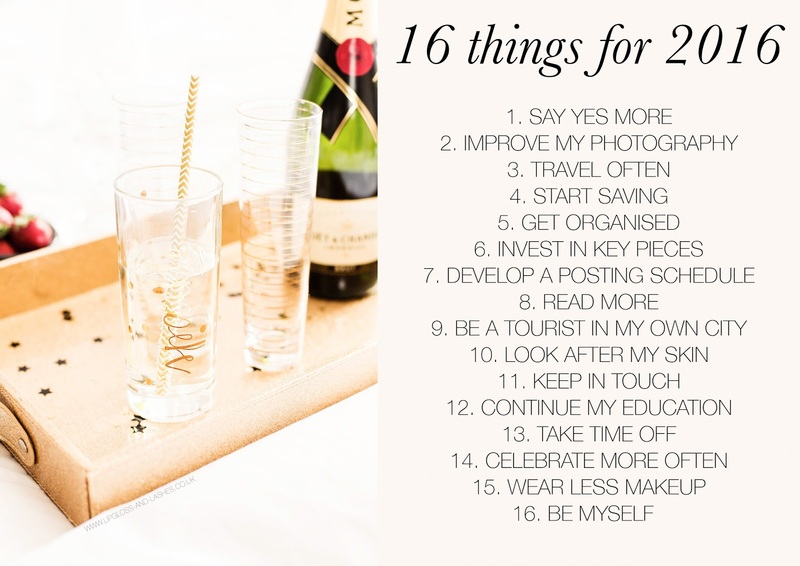 Great post and a lovely list of achievable goals. For what it's worth, I love your blog photos! 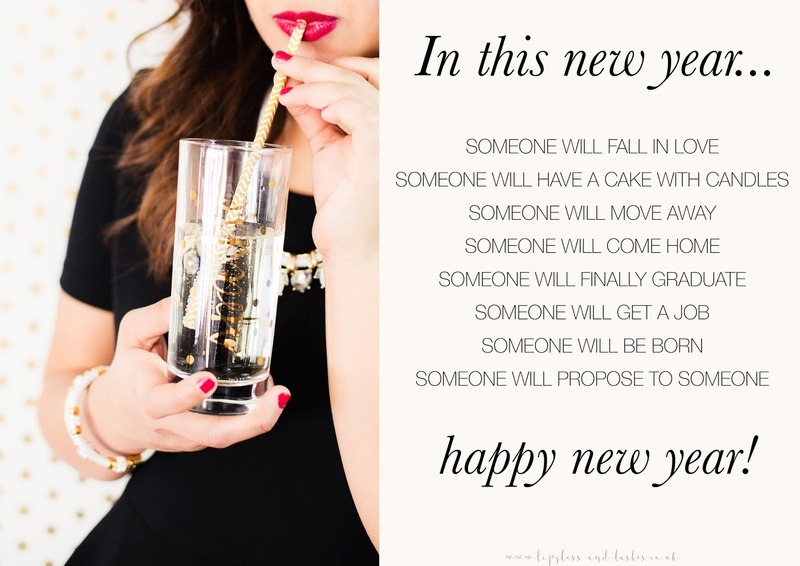 These are really great resolutions! I love the idea of saying yes more. That is something I am trying to do as well....to be open to new things! This is such a cool list and hope you achieve them. I might take a few for my own personal goals. Good luck with those, a nice set of goals you have there. I personally want to read more. Trying to find time between being a mother, and work is hard.